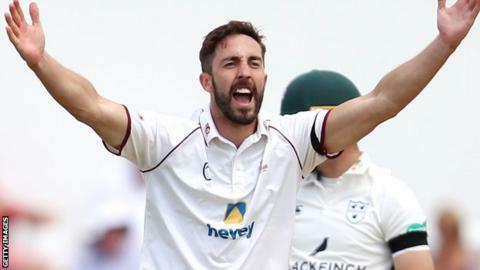 Northamptonshire remain on top over Leicestershire following two days of their day-night Championship match. The visitors, who resumed on 65-4, found themselves 65-7 with Richard Gleeson (3-33) and Ben Sanderson (3-36) sharing three wickets in 14 balls. Mathew Pillans (35) and Lewis Hill (38 not out) put on 60 for the ninth wicket to push the total to 157 all out. Northants closed on 60-3 in their second innings, leading by 164 runs, with Alex Wakely 34 not out. It represented a recovery for the hosts, who slipped to 12-2 after losing Rob Newton to Dieter Klein for eight and Ben Duckett to Clint McKay for a second-ball duck. Earlier, Leicestershire lost four wickets in the first 15 overs of the day and were grateful to Pillans and Hill to push the total into three figures, before Muhammad Azharullah (3-52) became the third Northants bowler to take three wickets in the innings.